If you love, you will grieve-and this book is for you. Grief and love are two expressions of the same process-and nothing is more mysteriously central to becoming fully human. For any who love, grieving is all but inevitable. When a loved one dies, the pain of loss can feel unbearable-especially in the case of a traumatizing death that leaves us shouting NO! with every fiber of our body. Grief commands our attention and erupts unpredictably, inescapably. The process of grieving can feel wild and nonlinear-and often lasts for much longer than other people, the non-bereaved, tell us it should. And it is important. Dr. Joanne Cacciatore, a bereavement educator, researcher, and leading counselor in the field, accompanies us in the painful process of transformation through love, loss, and grief. This beautifully-written companion for life's most difficult time is heartrending and utterly healing-revealing, in an undeniably personal way, how grief can open our hearts to interconnection, compassion, and the very essence of our shared humanity. Through generous, insightful writing and moving stories of her encounters with grief over decades of supporting individuals, families, and communities-as well as her own experience with loss-Cacciatore opens a space for us to process, integrate, and deeply honor our own grief. 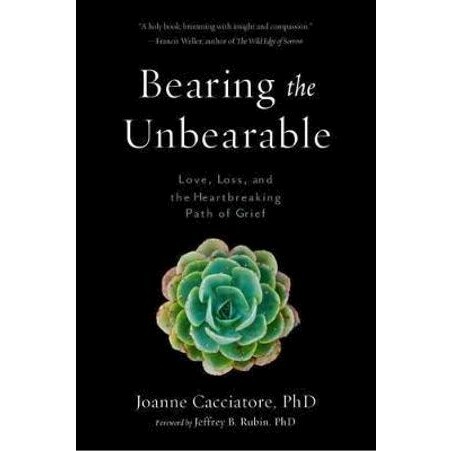 Not just for the bereaved, Bearing the Unbearable will be required reading for grief counselors, therapists and social workers, clergy of all varieties, educators, academics, and medical professionals. Organized into 52 accessible and stand-alone chapters, this book is also perfect for being read aloud in support groups.